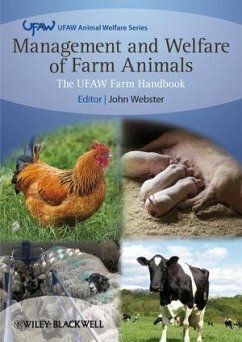 Through successive editions, Management and Welfare of Farm Animalshas gained international recognition as a classic introductorytextbook for students of agriculture and veterinary science.Conceived by the Universities Federation for Animal Welfare (UFAW),the book has always sought to promote the humane treatment oflivestock within the practical business context of modern farming. Now fully revised and updated, this fifth edition remains themost comprehensive and accessible guide available. Three animalgroups appear here for the first time (game birds, South Americancamelids, and ostriches), and a chapter on horses has also beenrestored. Throughout, the book offers clear advice for the humanemanagement of all major farmed species in the primary context oflarge-scale food production. However, this edition also takes full account of consumer demand(and legal requirements) for alternative farming methods andenhanced welfare standards, whether in conventional agriculture orthe smallest of 'hobby' farms. Brand new chapters reflectfresh understanding of welfare science, ethics, and the role ofsociety in ensuring the best possible farm conditions. It remainsan indispensable resource for students, and for all those seekingto promote animal welfare. Published as a part of the prestigious Wiley-Blackwell - UFAWAnimal Welfare series. UFAW, founded 1926, is an internationallyrecognised, independent, scientific and educational animal welfarecharity. For full details of all titles available in the UFAWseries, please visit www.wiley.com/go/ufaw. John Webster is Emeritus Professor of Animal Husbandry at the University of Bristol. Author of the widely acclaimed Animal Welfare: A Cool Eye Towards Eden and Animal Welfare: Limping Towards Eden, he is the founding father of the Bristol Animal Behaviour and Welfare Science group that has gathered evidence and pioneered the arguments necessary to achieve improved welfare standards for veal calves, broiler chickens, laying hens and dairy cows. UFAW is an internationally recognised, independent, scientific and educational animal welfare charity concerned with improving knowledge and understanding of animals' needs in order to promote high standards of welfare for farm, companion, laboratory, captive wild animals and those with which we interact in the wild.